The marks of time are stamped across the landscape on this 286-mile/460-kilometer route through prehistoric fossil beds, mining boomtowns and surprising sights like the Painted Hills. Driving across northeastern Oregon is a trip through the state’s historical timeline. This route begins at the Columbia River, the traditional fishing and gathering grounds for generations of Native Americans. It travels through river canyons and into the John Day Fossil Beds National Monument, where 55 million years of life are preserved in the rocks. And it explores communities past and present that tell stories of the state’s hardworking heritage in the woods, in the mines, on the ranches and on the railroad. The byway begins at Biggs, along the Columbia River, and curves up US-97 between the canyons of two more major Oregon rivers: the Deschutes and the John Day. The skies here seem huge and the views stretch for miles, with checkerboard wheat fields, undulating golden hills and spinning wind turbines. In Moro, the Sherman County Historical Museum collection includes thousands of artifacts of Native American life, Oregon Trail migration and wheat farming. Continuing south, Shaniko was the wool shipping center of the world in the 1880s. Today this living ghost town springs to life at annual events celebrating its heritage. 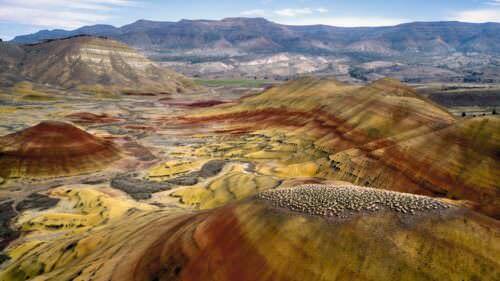 The byway heads east along OR-218 from Antelope to the Clarno Unit of the John Day Fossil Beds National Monument. The three John Day Fossil Beds units, all on the byway, comprise a remarkably diverse record of more than 2,000 species of plants and animals dating back 6 million to 54 million years, forming one of the most complete fossil records in existence. Interpretive trails guide you under castle-like cliffs and past easy-to-spot fossils exposed in the rock. 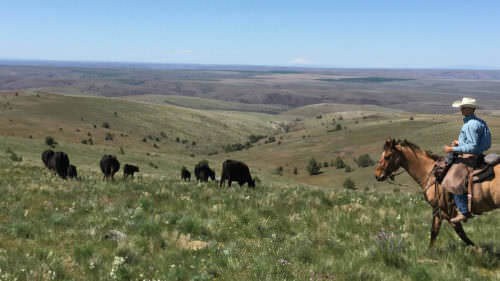 The byway heads northeast to Fossil, where the public can discover the region’s rich natural history at the Oregon Paleo Lands Center and dig in fossil beds behind Wheeler High School, then southeast to Service Creek. 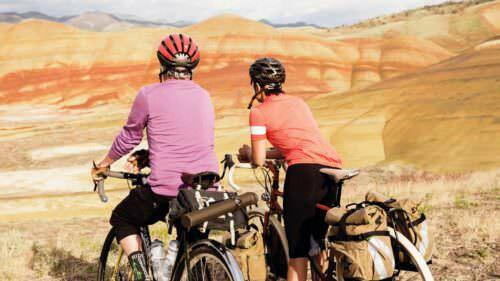 The newest section of the byway adds 65 miles/105 kilometers and includes the Painted Hills Unit of the John Day Fossil Beds National Monument via OR-207 and US-26. This spur forks south at Service Creek and continues to the town of Mitchell for access to the Painted Hills. From here the route heads east on US-26 to reconnect to the original byway at the intersection of OR-19. The extension of the byway through this landscape offers unforgettable views of ancient hills striped in dazzling bands of ochre, gold and bronze volcanic ash, and also connects all three units of the John Day Fossil Beds National Monument. The byway’s other route, from Service Creek to Dayville, twists along the Wild and Scenic John Day River, from which the fossil beds take their name. The John Day is the longest freeflowing river in Oregon and a delight for steelhead and smallmouth bass fishing as well as rafting in this arid climate. The North Fork joins the main stem of the river at Kimberly. Along the route between Kimberly and Dayville lies the Fossil Beds’ Sheep Rock Unit, where the visitor center has films, interpretive exhibits and local fossils on display, from ancient ferns to saber-toothed tigers. Trails lead through an amphitheater of bluegreen clay stone and up to an overlook of the John Day River Valley. Just before Dayville, the byway passes through Picture Gorge, with the river flowing below and jagged palisades rising above. The route follows US-26 east through John Day, once known for its cattle drives down Main Street, and the Kam Wah Chung State Heritage Site. The 1870s landmark was a general store, doctor’s office, herbal pharmacy and ad hoc community center for the Chinese workers who lived here in the 1880s. The site includes a museum and an interpretive center. Continue through Prairie City on a particularly scenic stretch of the byway, with the Strawberry Mountain Wilderness as a backdrop, and up into the Blue Mountains on OR-7. The byway passes Whitney, once a busy center for area logging, mining and cattle operations. Now abandoned buildings are all that remain in this easy-to-reach ghost town. East of the gold-mining center of Sumpter, the byway joins the Elkhorn Drive Scenic Byway and makes a gradual descent into the “Queen City of the Mines,” Baker City. Order a free Oregon Scenic Byways guide, or view a map of the Journey Through Time Scenic Byway online.